A Charity of the Year partnership with the Child Brain Injury Trust can offer huge benefits, while also helping to provide support for those who have suffered a life changing brain injury. It’s really easy for your business to get involved with our work. 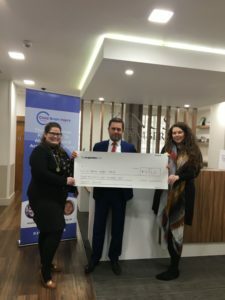 With unique opportunities for staff engagement, Charity of the Year partners work with us to raise money for the charity. From running marathons, climbing mountains, holding cake sales or fundraising balls, employees all over Britain are raising money for the charity whilst having a great deal of fun and, importantly, working better together as a team. Building a relationship with a charity like the Child Brain Injury Trust also helps you to increase engagement with your customers and with your employees. You will also benefit from positive local and national PR opportunities and national exposure via our social media networks. A creative and passionate team to support you and your organisation. A dedicated fundraising and volunteer Relationship Manager. Giving informative and motivational presentations to your staff. Supplying innovative but simple fundraising tips and ideas. A full communication and PR plan to support your fundraising goals, both for your colleagues and your customers. A variety of team building and skills-based volunteering opportunities. Call us now to find out more about selecting us as your Charity of the Year partner – 01869 341075. You can also email our Fundraising Team.